Yesterday, the Western New York Land Conservancy finalized a conservation easement on a 28-acre portion of the 36-acre North Tonawanda Audubon Nature Preserve, also known as Klydel Wetlands. The preserve is one of the largest remaining areas of open space within the city limits of North Tonawanda. It is owned by the Buffalo Audubon Society, with some portions co-owned by the Land Conservancy. The conservation easement will help ensure that the property remains a community asset, open and natural in perpetuity. Klydel Wetlands is home to an extraordinary ecosystem. 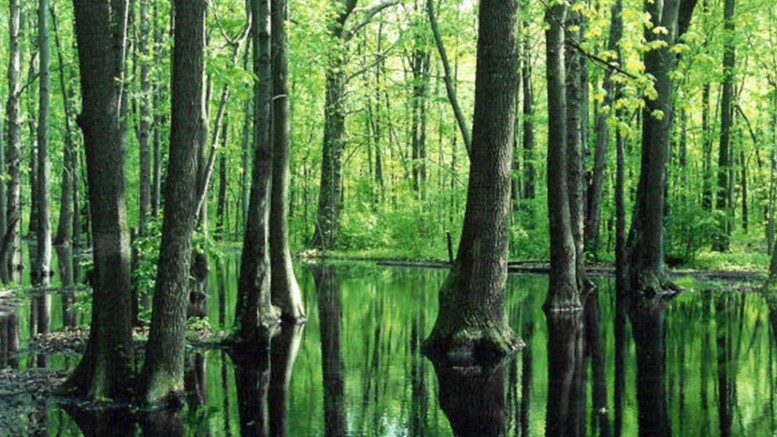 It includes a large wooded wetland with mature forests intermingled with seasonally wet vernal pools. These forests are home to numerous species of wildlife, including the small Eastern Screech Owl which nests in tree cavities there. Wetlands and forests along the Niagara River are home to at least eight species of frogs, two toads and seven salamanders, some of which are threatened with extinction. The vernal pools at Klydel Wetlands likely host some of these amphibians. Klydel Wetlands also provides benefits to the surrounding community in the form of “ecosystem services” by improving local water quality and providing flood control in adjacent neighborhoods. Unfortunately, wooded wetlands like these have long been drained to make way for other uses, and are still threatened today. Even Klydel Wetlands is only a fraction of the size that it once was. The North Tonawanda Audubon Nature Preserve is open to the public and has several walking trails that can be accessed from Fairfield Drive, Wurlitzer Drive, Sunset Drive or Kinkead Avenue. The Buffalo Audubon Society hosts regular nature hikes at the preserve, including very popular “owl prowls” where visitors often see or hear Eastern Screech Owls. The preserve is also an active site for school-based outdoor learning activities and research. Students and residents of the surrounding communities visit the preserve regularly. The Buffalo Audubon Society owns seven preserves across Western New York including the Beaver Meadow Audubon Center. Buffalo Audubon provides environmental education programming at these preserves and at locations across the region to connect children and families with the wonders of our natural world. The Western New York Land Conservancy is a regional, not-for-profit land trust that permanently protects land with significant conservation value in Western New York for future generations. The Land Conservancy envisions a future in which open spaces, working lands, wildlife habitat and scenic beauty are cherished and protected as part of the landscape and character of Western New York. The Land Conservancy is one of 1,700 land trusts nationwide, including 90 in New York State. Land trusts have protected 40 million acres over the last 20 years. For more information on upcoming events or the work of the Western New York Land Conservancy, please call (716) 687-1225 or visit http://wnylc.org/. Be the first to comment on "North Tonawanda Audubon Nature Preserve protected forever with a conservation easement"